Although - bar a couple of minor improvements - the core mechanics behind the automation of plugins and mixer parameters in Live 10 are the same as they have been for years, accessing automation lanes in the Arrangement View is now done on a modal basis, rather than having them ever-present. This means you can opt to only see automation when you need it, keeping the arrangement free of often-extraneous information and less prone to mousing mishaps. For more Ableton Live 10 tutorials, pick up the February 2018 edition of Computer Music. Step 1: New in Live 10 is a Logic-style global automation mode. In version 9 and earlier, automation lanes in the Arrangement View would pile up under channels, and were generally a bit fiddly. To demonstrate the new way of working, here’s a project we’ve created. Currently, we can see the track’s content, but with no automation data visible. Step 2: At the top of the tracks on the right sits the new Automation Mode button: a diagonal line with a node at either end. Toggle this, or press the A key on your computer keyboard, to engage Automation Mode. This reveals all tracks’ automation for editing only when you need it, to keep your project free of clutter and confusion. 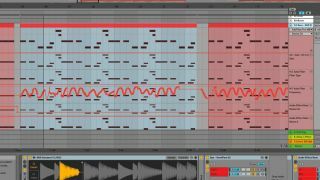 Step 3: As we mentioned in the intro, Ableton have made a couple of tweaks to the actual programming of automation, too. Double-click anywhere on an automation lane to create a breakpoint. Drag a breakpoint and you'll see that it’s now automatically quantised to the grid - hold Cmd/Ctrl as you drag to move it freely. When a time selection is made, all the breakpoints within can now be moved horizontally and/or vertically, too.